The new Hydro Xtreme electric diaphragm pump from Hydro Systems Company is equipped to handle water treatment chemicals, such as sodium hypochlorite, chlorine dioxide and hydrogen peroxide. It has a built-in microprocessor system control with an LCD display and can be programmed manually or with a water meter signal. The pump eliminates the need for squeeze tubes or additional controllers for water meters and pump circuits. There are two versions available, one for sodium hypochlorite and hydrogen peroxide and another for chlorine dioxide. The Hydro Xtreme is water- and UV-resistant and meets IEC specification IP65. CINCINNATI, Aug. 14, 2018 /PRNewswire/ -- Dover's Hydro Systems(NYSE: DOV), the world's largest independent manufacturer of chemical proportioning and dispensing systems, introduced Hydro Xtreme, an electric diaphragm pump designed to meet the needs of farms using highly aggressive chemicals, and to better manage fluctuations in water pressure, temperature and environmental factors. Hydro Xtreme is available in two versions, one designed for sodium hypochlorite and hydrogen peroxide and one for use with chlorine dioxide. Hydro Xtreme offers several advantages compared to peristaltic pumps, such as longer life, more precise chemical dilution and no need for costly squeeze tubes or additional controllers for water meters and pump circuits. "Maintaining a clean water supply is essential to keeping animals healthy and farms profitable," said Scott Campbell, Global Product Manager, Hydro Systems. "Increasingly, farms are moving toward electric diaphragm metering pumps to add essential yet harsher treatment chemicals to lines. Hydro's new pump offerings are better equipped to handle chemicals like sodium hypochlorite, hydrogen peroxide and chlorine dioxide than standard water-driven pumps." Greater accuracy over a longer period of time: the pump does not use squeeze tubes that can lose effectiveness and cause over or under treatment of water. Versatility: the pump can be programmed manually or with a water meter signal. Chemical compatibility of wetted parts: compatible with the most common chemicals used in water treatment like sodium hypochlorite, chlorine dioxide and hydrogen peroxide. Reliability: the pump is water- and UV-resistant and meets IEC specification IP65. It also has a two-year warranty that results in less maintenance and product downtime and can operate safely even in high water pressure conditions. Reduced cost of ownership: a separate controller is not needed to operate the pump and water meter system. 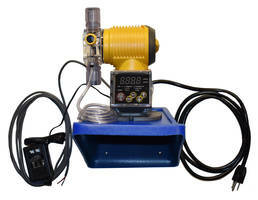 A built-in microprocessor system control is designed into the pump with LCD display. Easy installation: the pump can come pre-wired to interact with a water meter resulting in reduced assembly time and eliminating incorrect assembly. Easy maintenance: the pump is dust proof and can handle wash down duty. To learn more about Hydro Xtreme, visit www.hydrosystemsco.com/product/hydro-xtreme/. Based in Cincinnati, Ohio and with offices and support teams around the globe, Hydro Systems is the world's largest independent manufacturer of chemical injecting, proportioning, dispensing and medicating equipment. With strategic partnerships, innovative solutions and more than 50 years of experience, Hydro Systems is committed to enriching the lives of its customers by creating a cleaner, more sustainable world. Its products serve numerous dosing and dispensing applications within cleaning, commercial laundry, warewash, food service, industrial, irrigation, horticulture, dairy, animal health, water treatment and other industries. Hydro Systems ensures dosing is always accurate, safe and cost effective, helping customers clean with confidence. For more information, visit www.hydrosystemsco.com.